BUT...the really awesome thing they feature for those of us needing to exercise our creativity...is a section called "create". 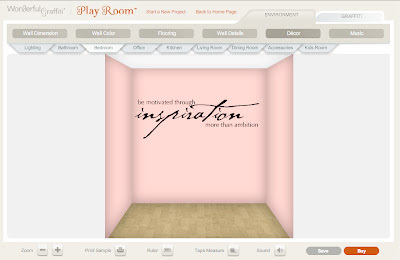 you can literally design a "basic" room to resemble a room in your home; a room with a wall you intend or would like to display a cool vinyl quote on. you can choose everything from paint color, room layout, decor pieces, flooring, windows, doors & even the music with which to sit and get creative by. "be motivated through inspiration more than ambition"
now go have fun with this...& happy thursday! you can get to my etsy shop from there also. I can do any custom work as well. thanks candi...i'll definitely check out your etsy shop.